For decades, paleontologists have puzzled over the microscopic fossils of Pseudooides, which are smaller than sand grains. The resemblance of the fossils to animal embryos inspired their name, which means 'false egg'. The fossils preserve stages of embryonic development frozen in time by miraculous processes of fossilisation, which turned their squishy cells into stone. Pseudooides fossils have a segmented middle like the embryos of segmented animals, such as insects, inspiring grand theories on how complex segmented animals may have evolved. 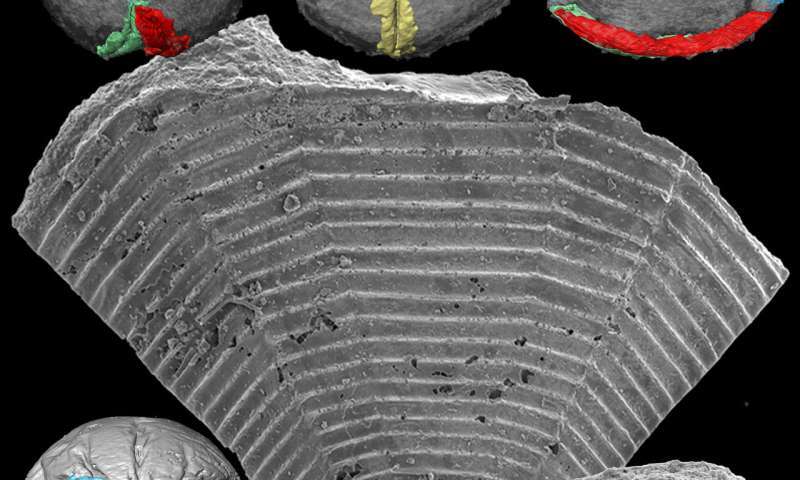 A team of paleontologists from the University of Bristol's School of Earth Sciences and Peking University have now peered inside the Pseudooides embryos using X-rays and found features that link them to the adult stages of another fossil group. It turns out that these adult stages were right under the scientists' noses all along: they have been found long ago in the same rocks as Pseudooides. Surprisingly, these long-lost family members are not complex segmented animals at all, but ancestors of modern jellyfish. Dr Kelly Vargas from the University of Bristol said: "It seems that, in trying to classify these fossils, we've previously been barking up the wrong branch of the animals family tree." Professor Philip Donoghue, also from the University of Bristol, co-led the research with Professor Xiping Dong of Peking University. Professor Donoghue added "We couldn't have reunited these ancient family members without the amazing technology which allowed us to see inside the fossilized bodies of the embryos and adults." The team used the Swiss Light Source, a gigantic particle accelerator near Zurich, Switzerland, to supply the X-rays used to image the inside of the fossils. This showed that the details of segmentation in the Pseudooides embryos to be nothing more than the folded edge of an opening, which developed into the rim of the cone-shaped skeleton that once housed the anemone-like stage in the life cycle of the ancient jellyfish. Luis Porras, who helped make the discovery while still a student at the University of Bristol, said: "Pseudooides fossils may not tell us about how complex animals evolved, but they provide insights into the how embryology of animals itself has evolved. "The embryos of living jellyfish usually develop into bizarre alien-like larvae which metamorphose into anemone-like adults before the final jellyfish (or 'medusa') phase. "Pseudooides did things differently and more efficiently, developing directly from embryo to adult. Perhaps living jellyfish are a poor guide to ancestral animals." Professor Donoghue added: "It is amazing that these organisms were fossilised at all. "Jellyfish are made up of little more than goo and yet they've been turned to stone before they had any chance to rot: a mechanism which some scientists refer to as the 'Medusa effect', named after the gorgon of Greek mythology who turned into stone anyone that laid eyes upon her." The Bristol team are still looking for fossil remains of the rest of Pseudooides life cycle, including the 'medusa' jellyfish stage itself. However, jellyfish fossils are few and far between, perhaps ironically because the 'Medusa effect' doesn't seem to work on them. In the interim, the embryos of Pseudooides have been reunited with their adult counterparts, just in time for Christmas. "The embryos of living jellyfish usually develop into bizarre alien-like larvae which metamorphose into anemone-like adults before the final jellyfish (or 'medusa') phase."